Salmon, Idaho is America at its best. A friendly family-oriented western town situated in the middle of cowboy country and well grounded in its traditional heritage. Whether you are looking for a family weekend getaway or a safe and friendly place to raise your children, Salmon is what you are looking for. You will begin to understand why the Salmon Valley is so special when you find yourself relaxing in one of our many natural hot springs after an invigorating hike. Or after you have retraced the steps of Lewis and Clark, perhaps you’ll indulge yourself in a real local experience and have a little slice of heaven in the form of a milkshake at the Shoup Store. Island Park – Located in town along the banks of the Salmon River. A favorite place to take a moment and enjoy the river and lunch. The kid’s will have fun at the skate board park. Kid’s Creek Pond – Located just south of Salmon on Hwy 93 it is stocked with fish and children are just about guaranteed to catch of fish. Lemhi County Historical Museum – Houses an extensive collection of Lemhi Shoshone artifacts. As well as displays of the areas rich cultural heritage in mining, logging and agricultural. Sacajawea Interpretive Center – Created to honor Sacajawea, who was born in the Salmon Valley, the Sacajawea Center provides visitors and locals alike a place to walk, visit, watch performances and learn about the area and the inhabitants. Salmon City Park – Located east of Salmon on Hwy 28 across from the Sacajawea Interpretive Center. Home of the City Pool, Lemhi County Memorial Rose Garden, Playground and Picnic Area. Catch a game at the ball park, shoot some hoops, improve your back hand with a game of tennis, or try for that elusive hole in one on the 9 hole golf course. There is also a large covered pavilion that can be reserved for Family Reunions, Company Bar-B-Q’s or any large gathering. Salmon RC Airstrip – If you are into remote control airplanes then you will love this unique airstrip located above the city of Salmon with spectacular views of the Continental Divide. Several Fly-ins held through the summer. 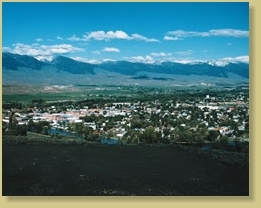 For more information, please visit the City of Salmon and Lemhi County websites.